For most people the idea of Paris draws thoughts of romance, of elegance, and probably of snobby little waiters with their noses in the air. However, for backpackers the first thought that comes to mind thinking of Paris is generally – well, this is gonna get expensive. The truth is, however, that Paris doesn’t have to be a complete budget buster. Sure, you’re going to pay more for beer if you decide to plop yourself down along Champs d’Elysee for a couple dozen 9 Euro pints, but if you’re smart about your spending in Paris I fully believe you can get both the Parisian experience and maintain a reasonable watch on your wallet. While there are a couple thousand Paris guides out there I don’t have to tell you about the main activities. Instead, I have compiled a short list of things that you can do for free or very cheap. 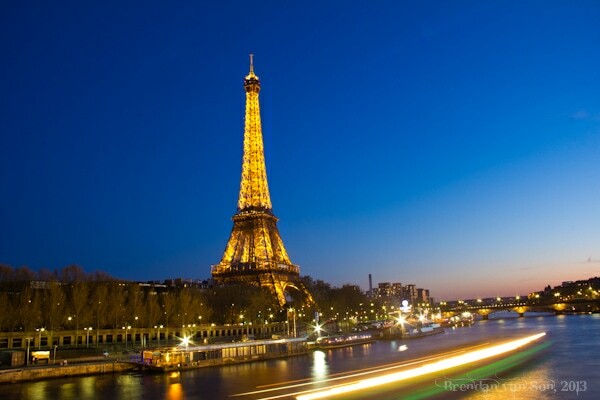 Photography: Paris is one of the most photogenic cities in the world. And lucky for you it’s not going to cost you a penny to spend a day or two photographing the beautiful architecture. My photos of Paris came out pretty well, and I loved wandering the city looking for a shot. Basilique du Sacre Coeur for Sunset: The sunset itself up here isn’t amazing. What is incredible is the crowd. The steps up the the basilica are covered with people and there are plenty of interesting characters around as well. Plus, if you wander around the corner you’ll get a great view of the Eiffel Tower in the distance. Notre Dame Cathedral: Finally, a church in Europe that doesn’t charge an entrance fee. This famous cathedral is free, and a must visit as well. Pompidou Center: This is a fun place to head to check out street performers. Picnic at the Eiffel Tower: It doesn’t cost anything to pack a couple sandwiches and enjoy them from the shadows of the Eiffel Tower. Oh right, you’d have to pay for the sandwhiches. 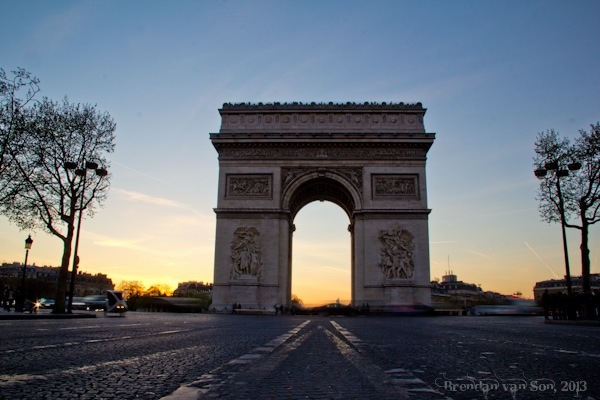 Art Galleries: There are a number of free art galleries in Paris. Some of the most popular include gallery Maeght and Lafayette. Wander the Parks: To my disappointment, Parc des Buttes isn’t a park for butts. However, it’s a great place to wander, relax or just get away from the noise of the city a bit. Hop on Hop Off: The Paris hop on hop off tours work like anywhere else in the world. You pay a price and have unlimited on the bus that circles to the various sights within the city. It’s a very good deal. Paris is a food paradise. But, the truth is that for the most part it is really expensive. I think that you should indulge yourself at least once in the city, but if you’re really on a budget you might want to follow the below advice. Hit the Bakeries: What’s more French than a roll of bread? Head to the bakeries and pick up some fresh bread, and then pop over to the grocery store for some toppings and you’ve got yourself a 3Euro lunch. Falafels and Kebabs: Generally speaking, if you want non-MacDonald’s fastfood this is what you’ll get. It’s delicious and it will rarely cost you more than about 6-7 Euros with a drink and fries. Crepes: Ok, maybe crepes are more French than a roll of bread. And a bonus is that they are quite cheap. You’re not likely to fill yourself up on crepes, but they make a nice bridge feed between bigger meals. Don’t Drink the Beer: I love beer, if it were legal I would legal bind myself to it through marriage. However, in Paris you’re going to pay an arm, a leg and probably a couple extra toes for a pint. Instead, stick to the wine or, better yet, tap water. Pizza Pizza: Paris seems to have a pizzeria on every corner. And although it’s not exactly cheap to eat as one meal, for those with smaller appetites it can be shared or stashed away to eat at a later date. When I stayed in the Avalon Hotel, which was beautiful (read my review here). It is likely out of the budget of most backpackers however. 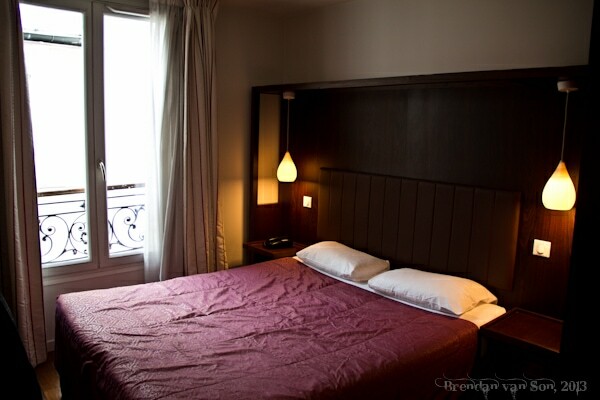 There aren’t nearly as many hostels in Paris as you might expect, and they all seem to lack in style and comfort. However, there do exist some budget options in town. The best of these options is likely St. Christopher’s Paris. Some others include La Montclair and Aloha Hostel. Paris is a hub for much of Western Europe. There are very few places you can’t get to directly from Paris. It would be silly for me to list the entire schedule. Basically, if you are heading north by train you’ll want to head to Gare du Nord station. If you’re heading south or east you’ll likely be heading out of Gare Lyon. If you’re using a Eurail pass, book at the train station a couple days early. If I remember correctly the reservation fee was 2 Euros for national services. If you’re going international it will be much more. In fact, the speedy train to London has a pretty hefty fee so be prepared for that.